Aleta — I always choose the Rumi: Heart of the Beloved wall calendar, with translations by Coleman Barks. His translations of Rumi are always inspirational, and I particularly love the Persian art. 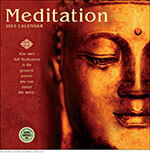 Dianne — For home I selected the Meditation calendar for its lush, intense images. On each day that I have taken time to go for a walk or to meditate, I place a little gold foil sticker (Remember those from elementary school? They still make me smile.). I love celebrating these simple acts of self-care. I feel gratitude for each little star. For the office, I selected Hafiz. The text is extraordinary and I love the intricately layered artwork of Silas Toball. Ethan — Hanging at my office desk is the Gardens of the Spirit wall calendar. The calming photographs of Japanese gardens provide a nice sanctuary for my eyes when the computer screen has strained them. At home I have the Bicycle Bliss calendar reminding me to get outside and enjoy a rambling ride without a destination. Lawson — As an avid Tai Chi Chuan player, I enjoy the Tai Chi Spirit calendar as a reminder of my practice while sitting in the office. At home, The Lakota Way calendar provides a unique philosophical perspective that I enjoy exploring. Leslie — I have four places where I put up wall calendars. Two are for functional use (at home on the fridge and by my desk at the office). The other two are purely for visual pleasure: an artistic statement as a part of my home and office decor. Needless to say, it is really, really hard to choose which four out of all 70 that we publish. Knowing that they are all my favorite children (teehee), here are some that have graced my walls in the past: Gig Posters for the awesomely groovy graphics; Zen Mind for the sophisticated Zenga brush art; Meditation for the lovely images and calming, meditative quotes; The Organic Kitchen Garden because I am a foodie; and The Power of Now for the gorgeous nature photos and make-you-think-deep-thoughts quotes. This year it will be: Earth Is My Witness, Faerie Houses, Environmental Art, and Simply Raw. 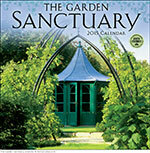 Lydia — This year I have The Garden Sanctuary calendar in my kitchen. I love the garden structures and meditative spaces. They’re calming and inspirational at the same time. Gardening is my second love, right after creating spectacular calendars. Also at home, my daughters chose Day of the Dead: Sugar Skulls which was a close second for me too. Michelle — Meditation at home, because who couldn’t use some mindfulness. Eight near my desk at the office. I love all of our calendars! And I’m especially fond of bright colors. Neil — I’m a fan of the Green Patriot and Posters for Peace & Justice calendars. There is a great assortment of artists in both calendars and the artwork is engaging. I’m an activist at heart (currently posing as a bookkeeping stickler). Susan — I absolutely love the Women of Myth & Magic wall calendar because Ms. Craft’s illustrations are incomparable and inspiring. Her paintings have a depth and richness that touch something in me and reminds me to look closer. I feel like I have a priceless painting on my wall next to my desk — a painting that changes every month! Tim — You know me, one calendar is not enough! We have the Meditation calendar up in our kitchen at home. Michelle chose that one, and a great choice it is. The image for January is a Buddhist statue of a Dakini (a female messenger of wisdom) making an offering. The image is paired with the Rumi quote: “What you seek, is seeking you.” That’s a powerful combination. At work I have to say I have 25 calendars up in my work area. I love them all, but I have a special affection for Zen Mind and Pema Chödrön. The combination of text and images there does everything I want our calendars to do. Our creative and development teams are currently working on our 2016 calendar line, which will include 7 brand-new titles along with many of your returning favorites. Look for our new title announcements in the coming months. This entry was posted in Awards & Reviews and tagged calendars, meditation on January 19, 2015 by Amber Lotus Publishing.